In cooperation with the famous pianist Paul Badura-Skoda, Modartt has constructed a Walter pianoforte add-on for Pianoteq. 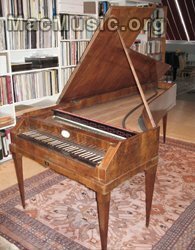 This particular instrument was made around 1790 and has a powerful sound strengthened by its Viennese pianoforte action. Walter's instruments were frequently used by Mozart and were also praised by Beethoven.